4:1 And the people of Israel again did what was evil in the sight of the Lord after Ehud died. 2 And the Lord sold them into the hand of Jabin king of Canaan, who reigned in Hazor. The commander of his army was Sisera, who lived in Harosheth-hagoyim. 3 Then the people of Israel cried out to the Lord for help, for he had 900 chariots of iron and he oppressed the people of Israel cruelly for twenty years. 7:1 After this Jesus went about in Galilee. He would not go about in Judea, because the Jews were seeking to kill him. 2 Now the Jews' Feast of Booths was at hand. 3 So his brothers said to him, “Leave here and go to Judea, that your disciples also may see the works you are doing. 4 For no one works in secret if he seeks to be known openly. If you do these things, show yourself to the world.” 5 For not even his brothers believed in him. 6 Jesus said to them, “My time has not yet come, but your time is always here. 7 The world cannot hate you, but it hates me because I testify about it that its works are evil. 8 You go up to the feast. I am not going up to this feast, for my time has not yet fully come.” 9 After saying this, he remained in Galilee. 1And the children of Israel again did evil in the sight of the LORD, when Ehud was dead.2And the LORD sold them into the hand of Jabin king of Canaan, that reigned in Hazor; the captain of whose host was Sisera, which dwelt in Harosheth of the Gentiles.3And the children of Israel cried unto the LORD: for he had nine hundred chariots of iron; and twenty years he mightily oppressed the children of Israel.4And Deborah, a prophetess, the wife of Lapidoth, she judged Israel at that time.5And she dwelt under the palm tree of Deborah between Ramah and Bethel in mount Ephraim: and the children of Israel came up to her for judgment.6And she sent and called Barak the son of Abinoam out of Kedeshnaphtali, and said unto him, Hath not the LORD God of Israel commanded, saying, Go and draw toward mount Tabor, and take with thee ten thousand men of the children of Naphtali and of the children of Zebulun?7And I will draw unto thee to the river Kishon Sisera, the captain of Jabin's army, with his chariots and his multitude; and I will deliver him into thine hand.8And Barak said unto her, If thou wilt go with me, then I will go: but if thou wilt not go with me, then I will not go.9And she said, I will surely go with thee: notwithstanding the journey that thou takest shall not be for thine honour; for the LORD shall sell Sisera into the hand of a woman. And Deborah arose, and went with Barak to Kedesh.10And Barak called Zebulun and Naphtali to Kedesh; and he went up with ten thousand men at his feet: and Deborah went up with him.11Now Heber the Kenite, which was of the children of Hobab the father in law of Moses, had severed himself from the Kenites, and pitched his tent unto the plain of Zaanaim, which is by Kedesh.12And they showed Sisera that Barak the son of Abinoam was gone up to mount Tabor.13And Sisera gathered together all his chariots, even nine hundred chariots of iron, and all the people that were with him, from Harosheth of the Gentiles unto the river of Kishon.14And Deborah said unto Barak, Up; for this is the day in which the LORD hath delivered Sisera into thine hand: is not the LORD gone out before thee? 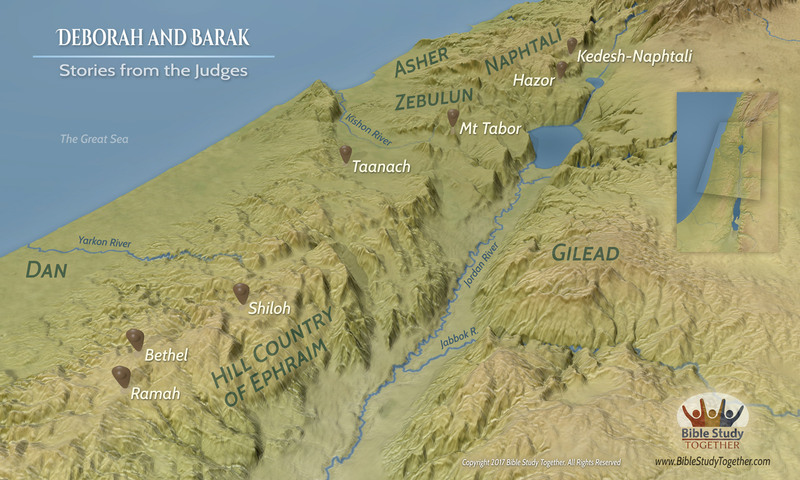 So Barak went down from mount Tabor, and ten thousand men after him.15And the LORD discomfited Sisera, and all his chariots, and all his host, with the edge of the sword before Barak; so that Sisera lighted down off his chariot, and fled away on his feet.16But Barak pursued after the chariots, and after the host, unto Harosheth of the Gentiles: and all the host of Sisera fell upon the edge of the sword; and there was not a man left.17Howbeit Sisera fled away on his feet to the tent of Jael the wife of Heber the Kenite: for there was peace between Jabin the king of Hazor and the house of Heber the Kenite.18And Jael went out to meet Sisera, and said unto him, Turn in, my lord, turn in to me; fear not. And when he had turned in unto her into the tent, she covered him with a mantle.19And he said unto her, Give me, I pray thee, a little water to drink; for I am thirsty. And she opened a bottle of milk, and gave him drink, and covered him.20Again he said unto her, Stand in the door of the tent, and it shall be, when any man doth come and inquire of thee, and say, Is there any man here? that thou shalt say, No.21Then Jael Heber's wife took a nail of the tent, and took an hammer in her hand, and went softly unto him, and smote the nail into his temples, and fastened it into the ground: for he was fast asleep and weary. So he died.22And, behold, as Barak pursued Sisera, Jael came out to meet him, and said unto him, Come, and I will show thee the man whom thou seekest. And when he came into her tent, behold, Sisera lay dead, and the nail was in his temples.23So God subdued on that day Jabin the king of Canaan before the children of Israel.24And the hand of the children of Israel prospered, and prevailed against Jabin the king of Canaan, until they had destroyed Jabin king of Canaan. 1After these things Jesus walked in Galilee: for he would not walk in Jewry, because the Jews sought to kill him.2Now the Jews' feast of tabernacles was at hand.3His brethren therefore said unto him, Depart hence, and go into Judaea, that thy disciples also may see the works that thou doest.4For there is no man that doeth any thing in secret, and he himself seeketh to be known openly. If thou do these things, show thyself to the world.5For neither did his brethren believe in him.6Then Jesus said unto them, My time is not yet come: but your time is alway ready.7The world cannot hate you; but me it hateth, because I testify of it, that the works thereof are evil.8Go ye up unto this feast: I go not up yet unto this feast: for my time is not yet full come.9When he had said these words unto them, he abode still in Galilee. Why were the people of Israel cruelly oppressed for 20 years? How does judges illustrate that God uses people to accomplish His purposes? Why does the world hate Jesus? How do you respond to Jesus when He exposes your works? Show love to someone who hates Jesus.